Those color books are coming along nicely. We only have one more color before they get to go home to mom and dad. 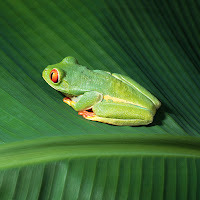 This week our color was green--had lots of fun with this one. First of all, we had to do the ever popular mixing of Play Doh. They all got some blue and yellow Play Doh and we made green--they love this activity. I think they're sad when we don't have colors to mix. The best part came today. In The Mailbox, Aug/Sept. 2002 Kindergarten issue, they had a great activity that the children really enjoyed. It was a wonderful way to have fun wit h science, along with creating green. Each child got a baggie with one blue and one yellow ice cube inside. I had made the ice cubes and filled the bags at home. I also put some Duct tape over the top so they couldn't open the bag. I asked the children if they knew what was inside, how does it feel, what will happen if we play with these, what color will the water be? It really was great fun! My only issue--which I need to put my thinking cap on for--was that some of the children broke their bags. I thought about them opening the bag, but breaking it didn't occur to me. If anyone has ideas for next year, I would love to hear them. For green our color box got a lot of action--there's lots of green in the room. 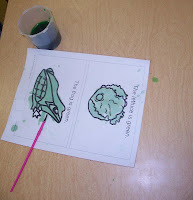 We colored a green frog and decorated a turtle's shell with green for the color book. We also did some green watercolor painting. I didn't have to bring a special snack in as our birthday boy today brought in cupcakes with green sprinkles--all avenues covered. Great fun this color week!